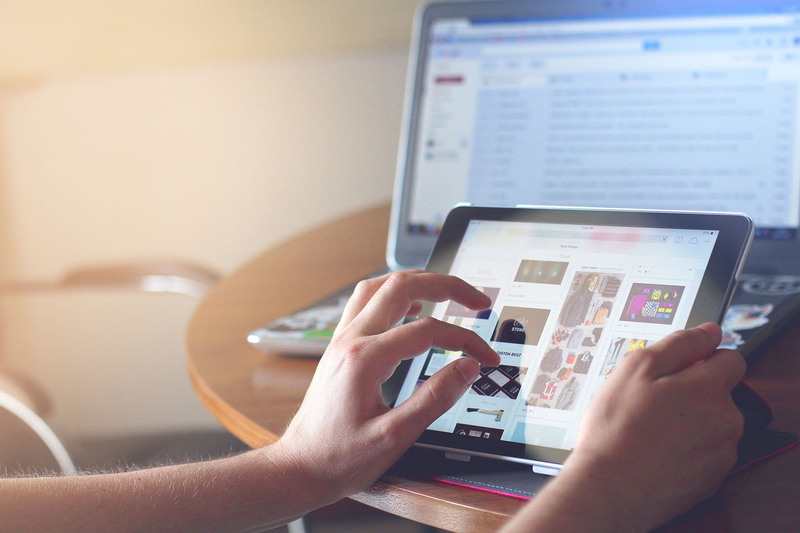 Product variations in WooCommerce allow you to combine multiple similar products into one listing, for example, different sizes or different colours of the same product. To enable variations, set your product to be a “Variable product” as per the instructions for adding a variable product here. Woocommerce product variations are managed independently for each product and rely on product attributes to create the variation options. Have a look at the two screenshots below showing an example of product attributes and product variations from Arianrhod Aromatics. You can see in the Attributes tab that this particular product has a size attribute set with two options, 15ml and Sample. You can also see the “Used for variations” checkbox is selected. If this checkbox is not selected then the attribute will not contribute to product variations. In the Variations tab, you can see that these two size attributes have been used to define two product variations, enabling customers to make a choice between two physically different versions of the same product. 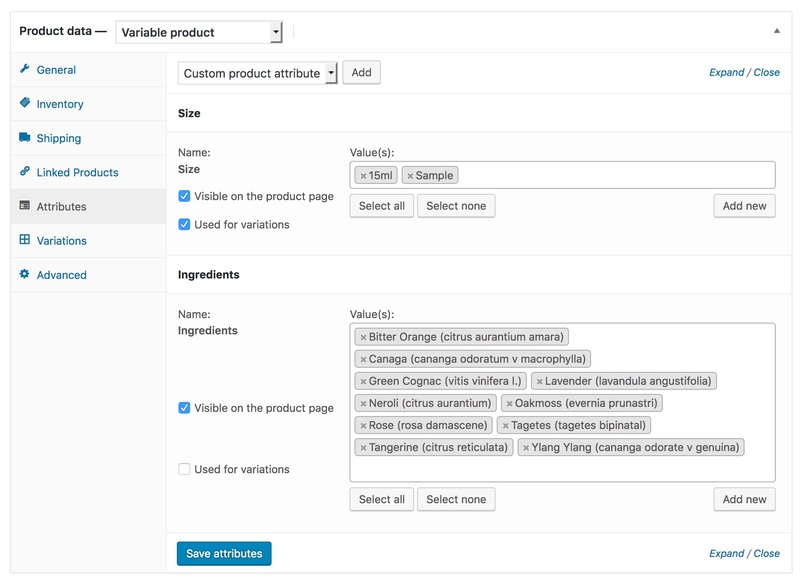 To create a new product variation, first add the attributes you will need. Click the Attributes tab on the left side of the Product data section. 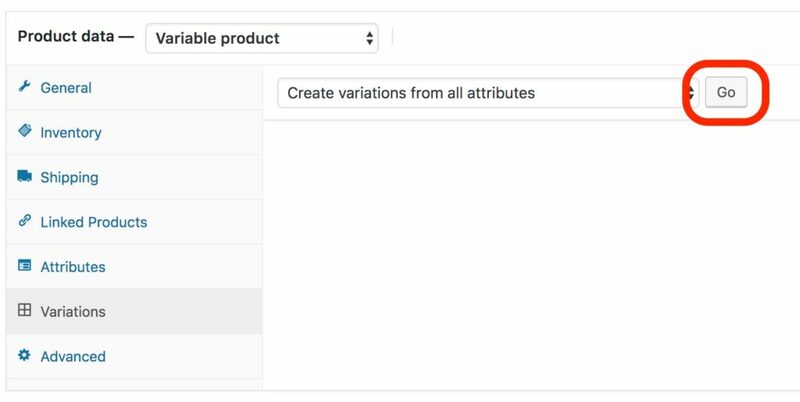 When you first open it on a new product, there will not be any attributes set. Click the Custom product attribute drop down box and select the attribute you would like to add to the product. Click the Add button beside the drop down box to add the attribute. When you add a new attribute, it will show in the Attributes tab with only the “Visible on the front page” option selected. This must be ticked to ensure your customers can see the attribute. Click inside the “Value(s)” box where it says Select terms and a drop down will appear showing you the options available for your chosen attribute. You can begin typing in the box to narrow the list of results down if there are a lot. Select the one you want from the list and then click inside the box again to select another one. 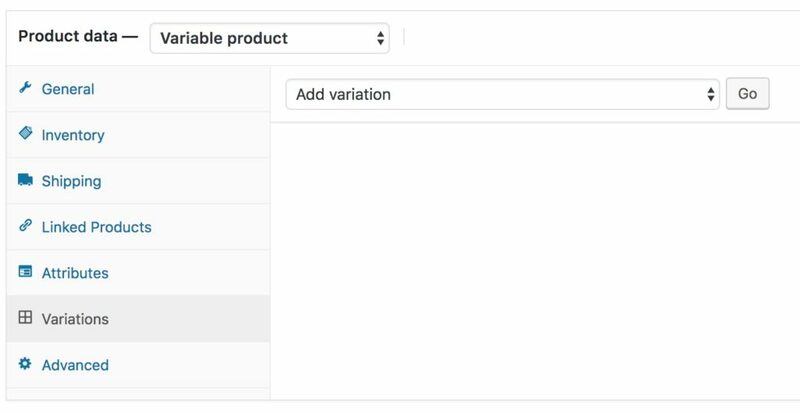 To make your attribute available for variations so your customers can choose what variation they want to buy, make sure to tick the “Used for variations” option. If you forget to tick this box, you will not be able to use this attribute for variations. Once you have your attribute all set, click the blue Save attributes button. Repeat these steps to add multiple variations to the product. Once you have all your attributes set, you can add them as variations. First, click on the Variations tab to expand it. From the “Add variation” dropdown box, select the “Create variations from all attributes” option to automatically create variations for all combinations of the attributes you selected to make available as variations. Click the “Go” button and wait a few moments while WooCommerce creates your variations. Your newly created variations will now appear in the Variations tab ready for configuration. The default variation is the option that will be pre-selected for a customer when they are browsing your product page. You can choose not to select a default variation, but the caveat is that the Add to Cart button will be greyed out until a variation is selected. By choosing a default, a customer is able to instantly purchase the product if the default option is what they want. From the “Variations” tab, click the drop down box labelled “Default Form Values“. Select your preferred variation from the list. You could use this to streamline the process for customers by selecting the most popular option as the default. You must create the variations before they will be available to select as a default option. To modify the details of a variation, or add variation images, please see our tutorial on editing variations. 0 responses on "How do you add variations to a Woocommerce product"